Exciting start for inexperienced KCKCC softball team – Welcome to Wyandotte Daily! 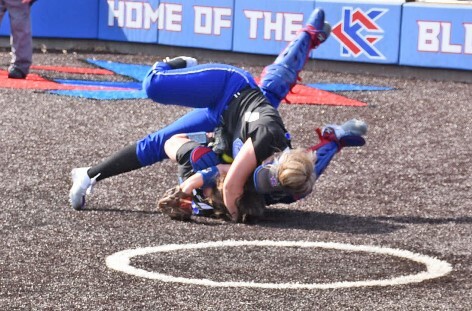 If a sweep of State Fair Tuesday is a harbinger of things to come, Kansas City Kansas Community College softball fans are in for an exciting season. Trailing State Fair 4-0 in the sixth inning of the first game of a doubleheader, the Lady Blue Devils rallied for six runs and then escaped a bases-loaded, no-out jam in the seventh inning to win a 6-5 thriller and then broke a 2-2 tie in the fifth inning for a 4-2 win in the nightcap. The win boosted KCKCC’s record to 3-1 heading into a Wednesday doubleheader with North Central College. Indeed, the Blue Devils got three straight hits with two out to overtake State Fair in the opener. 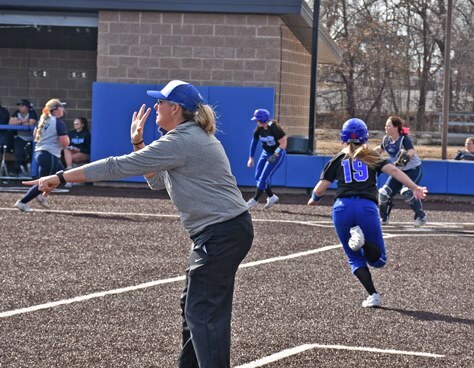 After a double by Kaylee Arnzen and a single by Jenni Mullins scored KCKCC’s first run, Paris Forshey and Shannon Brown singled to load the bases. Brittney Beck made it five straight hits with an RBI single and after a force out at home for the second out, Natalie Cowan singled for a third run, Kali Jacobson ripped a two-run single up the middle to put the Blue Devils ahead 5-4 and Jadyn Lindgren’s single added what proved to be the game-winner. Shannon Greene, the Blue Devils’ only experienced pitcher, then bailed herself out of a bases-loaded jam in the seventh. After State Fair loaded the bases on a bloop single, walk and infield hit with none out, Greene got the next two hitters on a fly ball and a ground ball. A bases-loaded walk trimmed the lead to 6-5 before a line drive to Jacobson at third base sealed the win. In the nightcap, the Blue Devils bounced right back after State Fair had tied the game 2-2 with two runs in the fifth. A single by Arnzen, walk and a passed ball scored KCKCC’s go-ahead run and a Forshey ground ball made it 4-2. The Blue Devils’ first two runs came in the first on a walk, a single by Jacobson and RBI ground balls by Jadyn Lindgren and Arnzen. Freshman Katelyn Kittrell of Lansing got the pitching win, allowing two runs and striking out three in five innings before another frosh, Faith Maslak, preserved the win, giving up two hits and walking one. With Shannon Greene the only Blue Devil to record significant playing time in last year’s 23-22 season, this is Tillery’s most inexperienced team with four freshmen starting in the first game, five in the second along with a reshuffling of sophomores with limited playing experience. The starting infield was made up of Jenni Mullins, a converted third baseman who played in 12 games last season at first base; Natalie Cowan, who had just 19 plate appearances in 27 games at second; Kali Jacobson, a transfer from Bethany College via Basehor-Linwood at third; and freshman Kaylee Arnzen at shortstop. Yet another third baseman, freshman Brittney Beck, moved to catcher, while sophomore Lauren Scott recovers from an off-season leg injury. In the outfield, Shannon Brown moved from the infield where she played in just five games to centerfield where she’s flanked by a pair of freshmen, Parish Forshey of Bonner Springs and Jadyn Lindgren ahead of two other frosh, Lincoln Schwisow of Basehor-Linwood and Logan Tucker. Freshmen will also carry the pitching load when Greene isn’t on the mound, A righthander from McLouth who started 19 games last season, Greene has signed to attend Aurora College in the fall. In addition to Kittrell and Maslak, the pitching staff includes Shelby Espy, Sidney Duval, Haley Luna, Aspen Salinas and injured Hanna Hurt. Espy, Salinas and Logan Tucker will also see duty on the infield along with Dawsyn Long and Gracie Gentry. All are freshmen. Play in one of the nation’s toughest conferences is next up for the Blue Devils and no team in the Jayhawk has a tougher start. The Blue Devils will play host to No. 5 ranked Johnson County in the opener Tuesday at 1 p.m. followed by road tests at No. 11 Cowley College and No. 16 Highland.